These are not Waukee Community School District publications or events. Information is being distributed as a community service to inform stakeholders of community activities or services. Heartland Youth Choir is registering boys and girls in grades 4-8 for a week of music and fun in SummerSongs! Choir Camp July 7-12, 2019. Please see the flyer for more information and registration. Heartland Youth Choir is registering boys and girls in grades K-3 for a week of music and fun in SummerTunes! Choir Camp July 8-12, 2019. Please see the flyer for more information and registration. 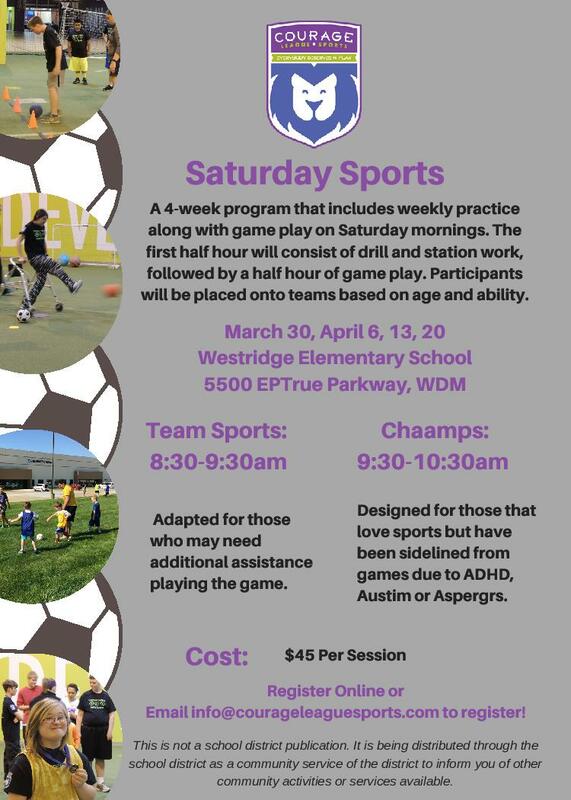 Waukee YMCA Spring Soccer Clinic for 3-8 year olds. Held Saturday afternoons in April and early May at Waukee Middle School. The Waukee Family YMCA offers a variety of half day sports clinics in June and July. The clinics include soccer, basketball, all sports, dodgeball, and flag football. Participants will learn to play together while enhancing their skills in the respective sport. Flag Football program for players ages 3 - 8th grade. Games are held on Sunday afternoons in April and May. 5 game season. Youth Volleyball Clinics for players in grades 3rd-7th. Held Thursday nights at Waukee Elementary in April/early May. 5 week clinics. This summer our week long sailing summer camps offer a fun and interactive week for youth and teens to learn about water and boat safety, basic sailing terminology, and how to sail a boat appropriate for their age and abilities. All courses taught by our skilled US Sailing Certified Instructors. 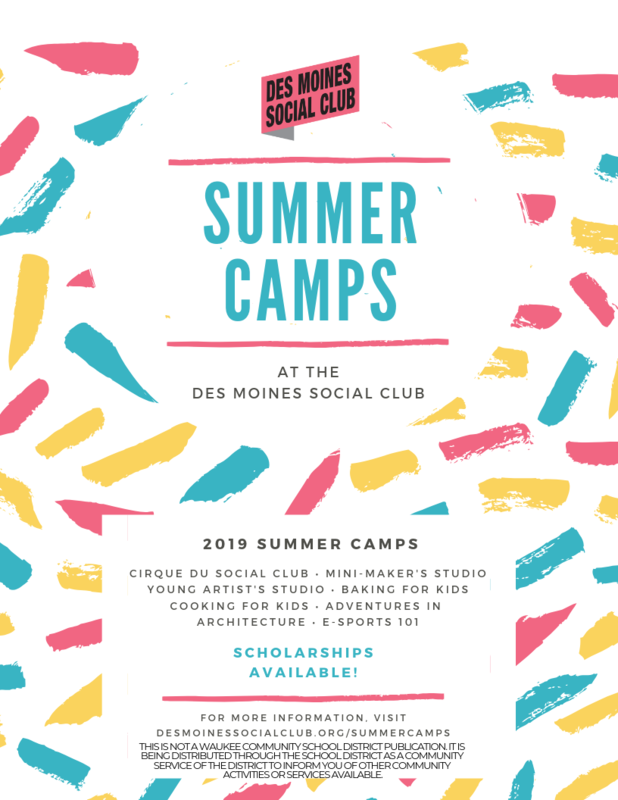 This weeklong day camp invites young artists to explore their talents and skills as musical theater actors in an original musical production. Each participant is guaranteed a role - assigned on the first day through an audition process - and will rehearse throughout the week. Courage League Sports is gearing up for another session of Soccer. Starting Saturday, March 30th we will offer BOTH Team Sports and Chaamps soccer clinics. We will work on the skills needed to play the game and have a scrimmage weekly. How does where you come from enrich your writing? Find out when you join award-winning author Stephanie Hemphill of Chicago for the Young Writers’ Workshop. Tour the museum’s archives, discover an artifact in the Visible Vault exhibit and weave the past into fiction that reflects you as a writer. Performing arts camps for grades 6-8 that focus on musical theater, improvisation, or intense Broadway immersion. Students will learn valuable performance skills and have a unique and fun experience! Guest Broadway performers lead teens in a weeklong series of master classes on acting, dancing and singing. Participants sharpen their performance skills, gain knowledge about the auditioning and casting process. The week culminates in a showcase for family and friends. Auditions are not required. This is a teen safe driving program. This 1 day event is not intended to replace drivers' education classes/programs. It is designed to go beyond today's required drivers' education minimums and help teenagers become smarter, safer drivers. This exciting, educational, hands-on, biotechnology CSI camp is filled with multiple exercises led by DMACC Criminal Justice and Biotechnology faculty. Students will immerse themselves in a world of forensic science, crime scene investigation, security and intelligence. The Drake football coaching staff is hosting a camp that will help develop a foundational level of football and have tons of fun doing it. You will be coached by Bulldog coaches and players. Registration for the fall TACKLE and FLAG season is open! The Waukee Youth Football League is a non-profit organization focused on the development of young athletes in the areas of football fundamentals and safety and is a USA Football Heads-Up Certified league. Fundraiser to benefit the Waukee Area Christian Services. Social Hour at 6 pm with event beginning at 7 pm. Plated Dinner with silent and live auction. Cost is $100 dollars a ticket. Event will be held at St. Boniface Church in Waukee on Friday, April 26th.  Locations vary by program. Please view our attached flyer for more details! Costs vary according to program. Please view our attached flyer for more details! Camp Fire offers day camps, overnight camps, environmental education, and short-term outdoor programs that include day trips. At camp, youth from different backgrounds develop important skills, such as self-reliance and problem-solving, while interacting with friends and nature. Rising 9th-11th grade students are invited to take advantage of the in-depth and exciting programming through a week-long Explorations program. Students have the opportunity to stay in a residence hall on Iowa State’s campus while spending their days in an engaging academic course. 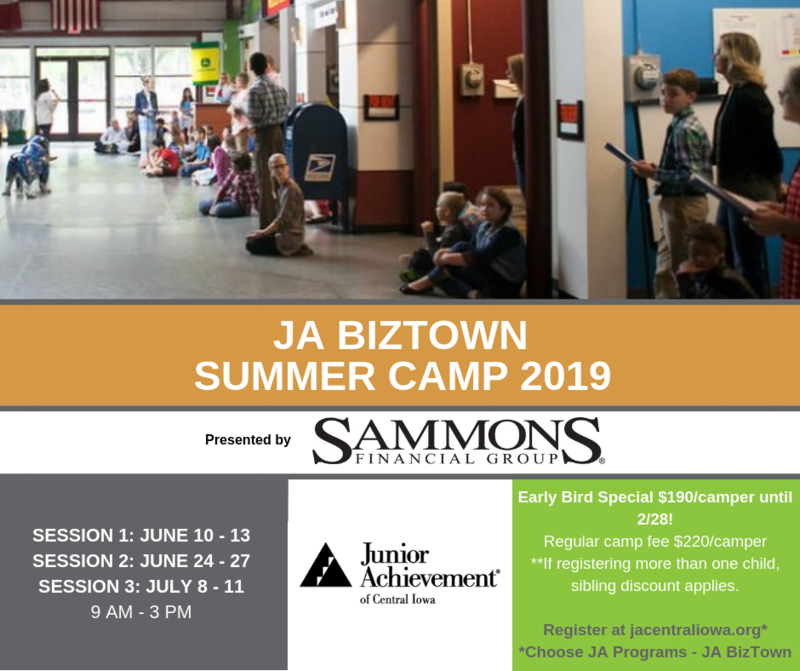 An exciting program designed with the needs of 7th and 8th graders in mind, students enroll in a course that is four full days of non-residential programming allowing them to dive deeper into their subject material. Campers in this program eat lunch on campus in a dining center with our team. Students in Adventures have the opportunity to learn about exciting subject areas in a fun-filled environment. The Adventures program for rising 3rd-6th grade students consists of half-day (non-residential) classes giving students an opportunity to take one to four classes during the two weeks. 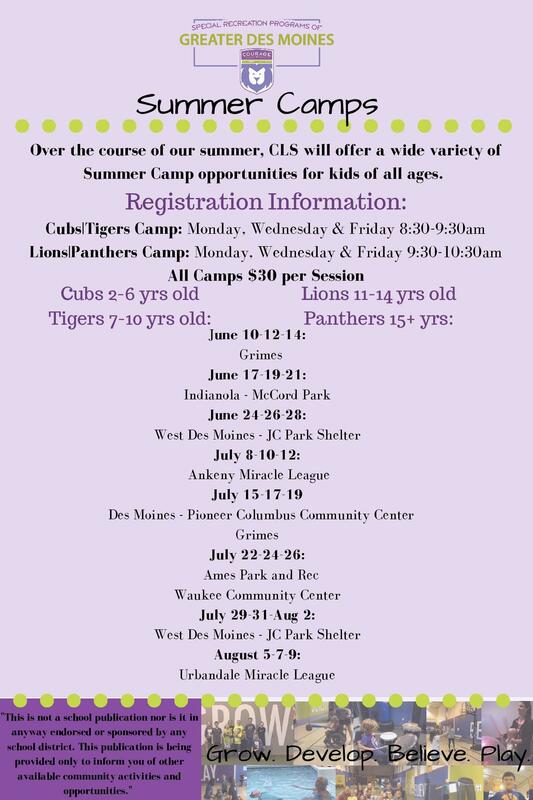 Over the course of our summer, CLS will offer a wide variety of Summer Camp opportunities for kids of all ages! Anyone! This is a family friendly event. Enjoy free kids activities including live performances, food samples from Jordan Creek-area restaurants, a hands-on look at construction trucks and emergency vehicles, activity booths and handouts from event partners, and inflatables, games, crafts and other outdoor activities for kids of all ages. Share your school-sponsored or non-profit organization events on the WaukeeBackpack. To ensure your submission will be accepted, read the WaukeeBackpack posting guidelines before submitting your event.